Doesn’t it sometimes feel like it’s impossible to be a parent and not multitask? As the mother of two very active children, aged 7 and 3, multitasking is not only a necessary evil, but crucial to me. When you add in the fact that I opened my own one-woman court reporting firm in July 2015, plus I have a host of health issues, things become much more difficult. My husband is not only understanding, but does more than the average bear around our home. That doesn’t change the fact that, as Mom (Momma, MOMMYYYYYYYYY!!! !, MOTHER! ), I do 90% of the listening-to-every-sound-and-analyzing-it-for-potential-likelihood-to-cause-death-or-dismemberment / organizing of activities & rides to and from activities / generalized and often unnecessary worrying around here. And since I work from home, I also do a great deal of the housework. All of this obviously requires a heck of a lot of multitasking. I need to be able to change a diaper while I listen to my older child’s long – and I mean, like, I’m-not-gonna-be-able-to-attend-your-4th-of-July-party-because-I’ll-still-be-listening-to-this-story-my-7-year-old-is-telling-me long – story about some kid I’ve never heard of who pushed down some other kid I’ve never heard of, the story ending with, “And then my hand started to hurt,” which has ABSOLUTELY nothing to do with anything she previously said, and I have to be able to convincingly feign understanding while avoiding being peed on by the diaperless one. 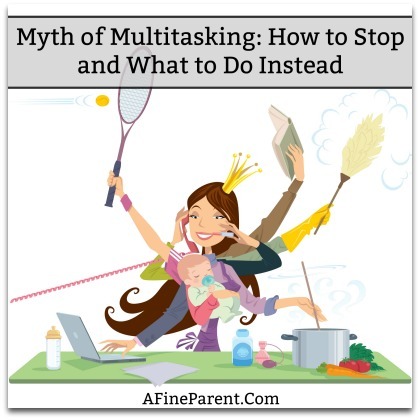 In a lot of parenting situations, multitasking is completely unavoidable. So, What’s Wrong with Multitasking? When I was growing up, multitasking was touted as a “skill,” and those most adept at multitasking were heralded as the kings (and queens!) of their industry. Recent research however is showing that multitasking is actually detrimental to productivity, and even damaging to the brain itself. A study at the University of London found that participants who multitasked during cognitive tasks experienced IQ score declines that were similar to what they’d expect if they had smoked marijuana or stayed up all night. IQ drops of 15 points for multitasking men lowered their scores to the average range of an 8-year-old child. Even if that’s the only consequence to multitasking, it’s still pretty terrifying. For example, losing just a half second of time to task switching can make a life-or-death difference for a driver on a cell phone traveling at 30 MPH. During the time the driver is not totally focused on driving the car, it can travel far enough to crash into an obstacle that might otherwise have been avoided. …the presence of a diverting influence such as a mobile phone may inhibit relationship formation by reducing individuals’ engagement and attention for their partners, and discouraging partners’ perceptions that any self-disclosure had been met with care and empathy. Indeed, such an impediment to relationship formation may be frustrating and isolating. In my own experience since starting my business in 2015, attempting to multitask – for me, meaning doing anything work-related while also caring for my children – was completely counterproductive. I got angry at both of them because they wouldn’t stop asking questions or fighting or spilling things for 10 seconds, which is entirely unfair. They got angry with me because they were bored and craved more attention and nurturing from me, which I couldn’t give and also meet deadlines. Also, completely unfair. Conversely, I noticed the more attention I devoted just to my children, without touching my phone or looking at my Apple watch, the more well-behaved they were. So, I tried to beat my multi-tasking habit. Once you get used to it, multitasking is a tough habit to beat! 1. Why did I go into business for myself? In a nutshell, I wanted more freedom and more time with my kids and husband. I wanted more control over my schedule, more say in who I worked with and what kinds of cases I encountered, and I didn’t want to spend my kids’ VERY SHORT childhoods working nonstop. 2. Has starting my own business actually helped me work toward the goal above? The answer to this, sadly, was a resounding NO. If anything, I was more stressed and working even more hours than before. This is fairly common when starting a new business, and I knew it would be rocky at first, but if I was/am going to make any progress toward the life I really wanted, I had to/have to make intentional choices to lead me there. 3. What can I do to set myself on the road to the life I really want? Much harder question to answer, and for a long time I didn’t feel like I had the TIME to sit down to even think about this! Around November 2016, though, I became entirely burnt out. Working was no longer exciting to me, it was a burden, and so was everything else. The stress caused by my inability to juggle everything and be the perfect business owner/wife/mother/sister/daughter/aunt/crafty-crafty mom was causing my health to go even more downhill. There was no solution BUT a solution, if you know what I mean. When I examined the three questions above, I realized that I was spreading myself WAY too thin, and nothing I was trying to accomplish was getting my full attention, least of all my kiddos. That’s so sad to write, but it’s true. I was multitasking in an effort to accomplish more, but I was accomplishing bupkis. So I started setting some limits. Get Ruthless In Evaluating “Opportunities”: I began saying “NO” to a lot of jobs that would call in, especially if I knew they would result in more stress than income. Set Up Specific Business or Personal Policies to Address Unanticipated Events: I set up an inclement weather policy stating if school closed, I would also be closed for the day, which is necessary if you live in Iowa, because sometimes we get no snow, and sometimes we get ALL THE SNOW. Demand More from Your Partner: I put my foot down with my husband, saying he had to take on some of the load if/when a child was sick or daycare closed or school was out on holiday, but I had to go out for a deposition. Maintain a Set Schedule: I set a start time and an end time for my workday (unless something weird happens). Limit Your Hobbies to Ones You REALLY Enjoy: I have hobby-ADD, so at any given time I may be trying to learn to draw, learn to fold origami, learn to utilize a bullet journal, and learn to use my Cricut machine. I’m sure you’ve concluded by now that I don’t do any of these terribly well, but I can do them all. Lately, I have abandoned my half-finished craft projects in favor of playing with my kids on their bedroom floors. Set a Schedule for Housework: Instead of trying to clean the whole house on one day on the weekend, I’m trying to spread it out more throughout the week. Live in the Moment: I’m learning to be more mindful, to have a more minimalist rather than consumerist approach to life. I’m learning to do more with less which has helped a lot. Remember You are Human, AND THAT’S OKAY!! : I do as much as I am capable of without sacrificing myself on the altar of perfection, and I’m coming to grips with the fact that that’s ok. This is, and will always be, a work in progress. As parents – and I think especially moms – we never feel “enough.” We’re not DOING enough; we’re not MAKING enough; we’re not THIN enough; we’re not WEALTHY enough. We all possess the tools to raise our children in exactly the way they need to be raised, even if that means the floor isn’t as clean as we’d like or we miss a deadline now and then. And sometimes that also means sitting our kids down and explaining that there will be times when Mom or Dad has to work late or go out of town, and that they need to learn to be respectful of that and to be flexible. Will we ever be able to give up multitasking entirely? Probably not. But being aware of its side effects and being intentional in our efforts to focus on one thing at a time – and then remembering to forgive ourselves when we don’t get this completely right – is a huge step in becoming better parents, and better people in general. When and where do I feel the LEAST stress, and why? Don’t answer the above questions with the intent of solving the entirety of the problem. Just identifying these areas is a huge step!! Be honest, and keep the answers as simple as you can. What can I do to change the most stressful time/place of my day into a positive? (For instance, building a “wind-down” period into the end of my work day to summarize what I accomplished and what should be accomplished the following day has helped me feel more organized and less scattered, and consequently curtail the craving to multitask). Do a cost/benefit analysis of the activities your family participates in, including extracurriculars and other things around the house. (If you’re like me and you bought a die-cutting machine, but it’s just making you angry because it’s so complicated, perhaps the cost is higher than the benefit, and you should sell that sucker. Or if your husband comes home grumpy every time he has bowling night, maybe that activity isn’t worth it. Or if you insist on cleaning the windows every Saturday morning, but you can’t get everyone else on board and you end up angry with everyone, maybe cleaning the windows shouldn’t be such a high priority). As with all new things, don’t expect to get this perfect, or even right, on the first try. It will take some tweaking and some self-examination and some time to get in the habit of only doing one thing at a time. But being more mindful of what you’re doing and how you’re doing it will add so much value to that activity, and you will eliminate a lot of stress. Cortney Kilby owns Kilby Reporting, Inc., a freelance court reporting agency serving Eastern Iowa and Western Illinois. She and her husband Brian were married in June 2003, and have a 7-year-old daughter and a 3-year-old son, both with flaming red hair and personalities to match. When not running from deposition to deposition and/or editing transcripts -- or going from dance class to soccer/basketball/t-ball to Girl Scouts -- or saving her son from eminent death via jungle gym/eating spare change/running headlong into the street/being accidentally impaled by his sister who seems to operate without regard for the existence of other physical objects or lifeforms -- Cortney enjoys sleeping (because: Narcolepsy), using the bathroom alone and starting 10 craft projects at once, none of which will ever be completed. Cortney is known for having funky hair colors, and has what others have described as "an unhealthy obsession with day planners and office supplies in general." Love love love your article! Thank you! Ah, autocorrect, you are not my friend! Thank you for sharing — keeping it real and funny so we feel inspired not to multi task another day! Thank you for the article. I really enjoyed it and the tips you gave, as well as how you kept it lighthearted! I think one of the most important parts was this:”Don’t answer the above questions with the intent of solving the entirety of the problem. Just identifying these areas is a huge step! !” It’s easy to get so wrapped up in trying to solve the whole problem (which seems terribly daunting) that instead of making any progress, we just shut down and don’t do anything at all. I’m going to try to follow this advice and simplify without feeling I need to have all the answers from the get-go. Hi, Katherine! I’m so glad you loved the article and a valuable takeaway for your life. It really is so overwhelming to try to solve the whole problem at once, but we all do it, don’t we? I have remind myself of my own advice on this one often! Love this!! Although I’ve got to admit I hopped onto the Internet to check for a spelling and got distracted…… But this was worth it – just this once! 😉 GREAT article, GREAT tips, GREAT writer!